(Newser) – A new drug for fatal injections is not only hard to find, it takes twice as long to kill people. 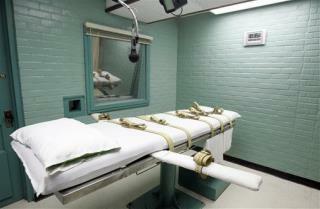 US death penalty states like Texas, Missouri, and Louisiana are struggling to find lethal drugs for capital punishment, thanks to a worldwide ethical embargo against pharmaceutical companies selling drugs to US departments of corrections, the Guardian reports. So those states are turning from a three-drug cocktail to one drug, pentobarbital—which takes an average of 20 minutes to kill rather than the cocktail's 10. But does the prolonged death equal inhumane treatment of the prisoner? This is ridiculous. Just have them strapped to a gurney in the prison garage while a couple of engines are running. WTF is wrong with these people? Change the frikkin laws to firing squads and be done with it! drug hell one .45 to the head and done!